I have a quick question for you at the start. How would you mention a person in your blog post? Mmm... Just type the name of that person? Or Name and link it to a social profile or blog? Most possibly you would say "YES" for one of them. Don't you? If you admire that person or feels your readers would love to get connected with that person, most probably you would give some more than a mention by linking a social profile or blog. Anyway, what if you can mention a person instantly when you writing a post without bothering to find exact profile URL and spending time to create a link? That'd be wonderful enough and save your precious time too. Isn't it? We have been experiencing the integration of Google+ social layer in Blogger. It's getting deeper and deeper as both products are of Google. Google +1 button, Google+ Badge and Google+ Followers are results of the integration of Google+ in Blogger blogging platform. Do you know what's now? 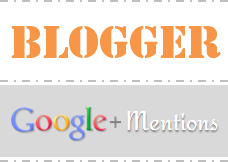 Blogger extending the blogging experience by offering Google+ mentions in your posts. Yeah, as like you mention users on Google+, now you can mention them in Blogger with the help of Google+ integration even the person is in your Google+ circles or not. Once you mention a person in your post, the name will be linked with his/her Google+ profile and your readers can easily find them on Google+ to connect with. Well, hold on. No need to jump on Google+ with the link. A hover card will be displayed when someone hover their mouse over the mention and readers can easily add mentioned person to their Google+ circles. Clicking on the link will lead them to full Google+ profile too. Don't believe me? Just hover your mouse pointer over the mention and see yourself here ~ +Mayura4Ever. Did you notice something strange? I just mentioned a Google+ page over there, not a person. Yes, I know what you thinking right now and it's true. You can mention Google+ pages too. Now, mention is done. After the mention and once the post goes live, you might reach them to say that they have been mentioned in your blog post. But you don't need to. Not anymore. Whenever you mention a person or page this way, the person or page will get a notification about the mention right after your post get published. Now, how about that? You have never taken time to tell people that they have been mentioned? Or always reach out to say "Hey, you are mentioned in my post"? Whatever it is, now Blogger made it easy. Start using this fabulous feature in your blog and let people know if they have been mentioned in your blog. Will you? First off, you need to integrate your Google+ profile with your Blogger account. Read How to Integrate Your Google+ Profile with Blogger and integrate your Google+ profile to activate Google+ mentions on your blog. 1. Now there's no bunch of steps to follow. Just go to your post or page and in the post editor, start typing with + or @ sign followed by the person name or Google+ page name. As you are typing the name, you will see list of people and page suggestions match with as below. 2. 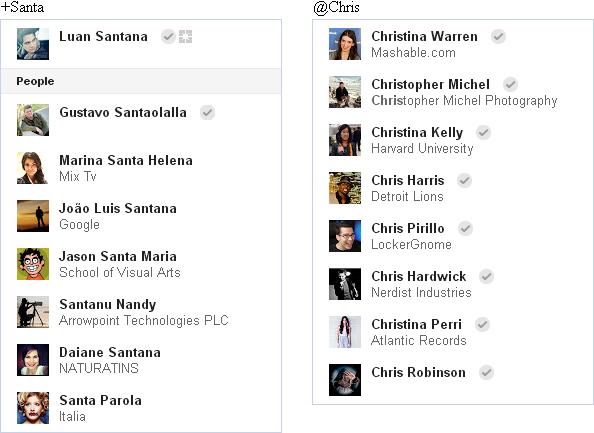 Once you find the person or page you need to mention in the list, click on it and the person or page will be mentioned. Note: The mentioned people or pages will be notified about the mention right after your post get published, but not right after you mention them while you writing the post. Wow! It would surely solve half the problem of informing people that they've been mentioned or request them to stop by because of their names being mentioned, which most of us have been doing so far! Absolutely it's a wonderful thought of the developer team and I love to see how technology make things much more easier for us dear :) Each time we mention people, we reach out them to say they have been mentioned. Now lot of time saves here and no need to think about even our posts being scheduled. Very interesting Mayura! Thanks for sharing! This is something very amazing, but I was thinking how they have been able to manage such a vast db, anyways you are doing a great job of serving the community with these great pieces of information. Are you in touch with Google development team at Mount view? Waiting for plugin in Wordpress. No, databases are managed separately but connections can be made easily with the core modules integrated in Blogger as Blogger users are now using Google+ profiles instead. So nothing to worry, if someone integrated Google+ in Blogger. It's not something new 'cause that's what Facebook has been doing with the integration at external websites with their social layer too since few years. Google+ is a new player and that's why it's available now. Oh no... I'm not in touch with Google developer team. I would if I work at Google ;) lol... But I'm exploring about Blogger updates as I'm interested in Blogger platform dear :) Anyway it's all for developers out there as we have no such resources even to try out, so I better focus on blogging. I'm glad to see all the wonderful changes Google is making with Blogger lately - they realize they must compete with WordPress. I'll have to see how to incorporate it into some of the Blogger blogs I have, thanks Mayura! I hope you'd love to make use of this feature on your Blogger blogs dear :) New year with new changes. Mayura, thank your keeping us, your readers, at the top of the changes with Google+ and other "technical" tools. After I read your posts, I learn something new and valuable and I even start feeling like a pro. Thank you for providing this education for us. Blessings! Thanks a lot for all these tutorials. You are really doing great updating yourself and us with all the changes that take place in Google and the other platforms. But this is a cool upgrade that Blogger has incorporated. I am using Wordpress and I hope to see these updates there soon. Thanks for the great information and the value you deliver with your tutorials. This was a very interesting post...even if I don't use Blogger. I'd love to see this feature on WordPress because I've mentioned a few people in my blog, but wasn't sure if it would be cheesy to contact them to tell them...either way, I doubt they ever knew I mentioned them in my post. I really like your tutorial posts. They are very helpful and you provide a lot of value! Anytime dear :) I believe in knowledge sharing, actually what we know. I'm learning from others as I have no idea at all about them such as you write about personal development :) All knowledge is nothing without sharing, no? That's really cool. I like you stating that you are feeling like a PRO ;) I know next year gonna be wonderful with all knowledge we acquire altogether. Oops... Well, as I feel, sometimes it's not a good way to tell them just they have been mentioned :) But something like "My post has been inspired by you" like that would be great, no? :) My friend, Lisa, has always being doing that and that's very nice. Why not, I like my tutorials too :D lol... Well, we all adding value to each others by our own blogs, no? :) I really like that. There is so much great information here, I tried to apply it, but instead book marked it for later. It is holiday season and I have guests at my home. Try to get work done? impossible. I want to thank you so much for this instructional post. Do you believe that I have not learned this yet? This is a must do after the family leaves! Ha ha... Now this is time to enjoy with your family and of course enjoy well there dear :) Again we gotta start do what we love and mostly we get busy there. Thanks for sharing this Mayura, look something interesting I've got today. wondering if I do this hope it will not gonna affect on my page load time. You just need to integrate Google+ in Blogger and it will be ready for you mate :) No, it won't affect pageload time severely as it's all about integrating with Blogger mate. Hope you will love that feature.